Chinese structures and an airstrip on the man-made Subi Reef at the Spratlys group of islands are shown from a Philippine Air Force C-130 transport plane, April 21, 2017. China’s astonishing expansion into the South China Sea’s 1.35 million square miles and its subsequent militarization of the region over the past several years has cultivated a complex security environment. The initial phase of that growing complexity was predicated on geopolitical interest and expansion, notably during U.S. President Barack Obama’s second term in office. Although it has been argued that regional tensions may remain stable because China has ceased its land acquisition endeavors to the south, the complex regional security environment may enter into a new phase of heightened tension and complexity during 2019. This next phase could emerge as a result of China’s dedicated push to consolidate its gains in the South China Sea (SCS) through the use of military and political powers in tandem with sharp threats as a result of military patrols and a quantum leap in the deployment of surveillance aircraft, guided-missile destroyers, and a bank of military equipment. Despite a momentary lull in adding to its treasure trove of SCS features, China’s behavior in the SCS exemplifies the aim of achieving regional dominance. However, Beijing has yet to achieve the level of control it seeks over the strategically vital waterway. In a region where five other parties – Vietnam, the Philippines, Indonesia, Malaysia, and Taiwan – have made territorial claims, China’s position remains under pressure and its territorial assets under continued threat. Indeed, Beijing’s outcry over what it sees as provocative U.S. incursions, which China has treated as naked military aggression, serves as a strong indication that China’s assets in the SCS and the country’s interests in the region remain vulnerable. So long as external threats persist, acquisition and buildup can be expected to move forward. With China’s initial island-building campaign nearly 10 years old, the next phase of China’s SCS expansion is the consolidation and military fortification of its territorial assets – garrisoning the many tiny islets once deemed uninhabitable, including the strategic Scarborough Shoal (Huangyan Dao), lying just 140 miles west of the large Philippine island of Luzon and currently under development. The establishment of military bases has culminated in the creation of China’s “strategic triangle.” Even with the construction of aircraft bases, detection systems, and weapon delivery systems, the impact of China’s methodical efforts in the SCS have failed to yield considerable change in the status quo of power relations. 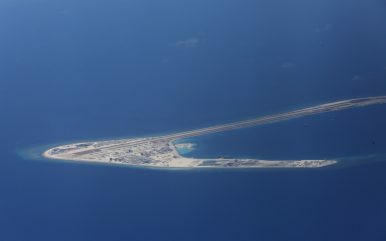 Over the past several years, China has expanded existing reefs and atolls by thousands of acres, but its military presence and preparedness still fall short of a level adequate for claiming control over the entire SCS. The process is likely to be a much longer one than expected. Islet acquisition and development has not mitigated existing territorial claims by other states sharing the sea, nor are those claims – supported by distant partners and allies – likely to disappear in the near or distant future. A combination of three factors exponentially raises the potential for further militarization in the SCS: China’s past expansion and continuing consolidation, which clash with persistent claims by states situated adjacent to the SCS; Washington’s declaration that the freedom of navigation (FON) principle of customary international law should be preserved; and Beijing’s departure from past promises not to further develop its SCS assets. Civilian and rescue operations have been the main justification for the ongoing construction of military installations and the placement of weapons and weapon systems, including sophisticated combat aircraft, surface-to-air missiles (SAMs), anti-ship (ballistic) missiles, and jamming technology, in spite of President Xi Jinping’s guarantee that China’s territorial assets would not be militarized. Beijing has indicated that future United Nation’s (UN) peacekeeping missions involving the People’s Liberation Army (PLA) would necessitate additional bases. These steps are key to strengthening China’s anti-access/area-denial (A2/AD) capacity. In light of China’s inability to match all aspects of U.S. military capability – at least in qualitative terms, though numerically-speaking, China possesses extraordinary military strength – in the short term, a military presence beyond China’s immediate borders is a logical and necessary rung if China hopes to project its power to a level that goes beyond parity in the SCS. China’s military investment continues to increase and the country, while facing a cluster of opposition off its eastern shores, has only a single front on which to focus. Such incidents as the arrest of Huawei’s chief financial officers, Meng Wanzhou and China’s persistent trade dispute with the United States have generated considerable attention, providing useful foliage for Chinese activities in the SCS. As a result, China’s interests in the SCS have become relatively peripheral in the media. Distracting issues also give China valuable time to establish a stronger military presence on its existing holdings in the SCS rather than seeking to expand and pursue additional reclamation projects. China has turned to other methods for rolling out its claim to the south in the recent past, with Brunei deepening its economic reliance on China via financial and trading arrangements. At the wave of a political wand, China not only secured a piece of its own interests, but those of Brunei as well, while acquiring a much-needed ally in the SCS region that can either remain silent or sway in a direction that suits Beijing’s strategic interests. The Philippines has cozied up to China after being successfully seduced by the promise of China’s Belt and Road. The grandiose development strategy is as much a political instrument as it is an economic initiative and one with which Beijing can increase its political influence over the policy trajectories of SCS states in the context of SCS claims and territory. Vietnam, however, remains comparably defiant and stalwart in its approach to the SCS, with a record of challenging China and systematic efforts to turn the SCS into a “lake” of its own. Vietnam’s efforts to proscribe Chinese ventures in the SCS, notably the creation of further artificial islands, an influx of warships, and the potential establishment of an air defense identification zone (ADIZ), demonstrate the limits of Beijing’s friendly pressure on others to quietly remove their flags from disputed areas. China has demonstrated that other avenues exist for inching its way forward in the SCS and expanding its de facto control. Dragging out formal talks and buying off its neighbors are just two possible tactics. Four years after Russia annexed Crimea from Ukraine, Moscow has and continues to employ similar tactics to tighten its hold on and increasingly fortify the Black Sea peninsula. Similarly, the idea that China will maintain its presence on numerous features in the SCS and increase its military presence in a show of control cannot easily be gainsaid, particularly as the culmination of China’s efforts to date have significantly augmented China’s military presence in the SCS and drastically upgraded Beijing’s peacetime and wartime position. Dr. Scott N. Romaniuk is a Postdoctoral Research Fellow in Security Studies at the China Institute, University of Alberta. His research focuses on China’s global security and military roles, China’s political, economic, and (cyber)security policies as well as the rise of security architectures in Asia, robotic systems in international security, and technology and the future of warfare. Tobias Burgers is a doctoral candidate at the Otto-Suhr-Institute (Free University of Berlin) where he researches the rise and use of cyber and robotic systems in security relations, and the future of military conflict. After the first test landing on a new runway in the Spratly, China is highlighting the civilian uses for its airstrip.